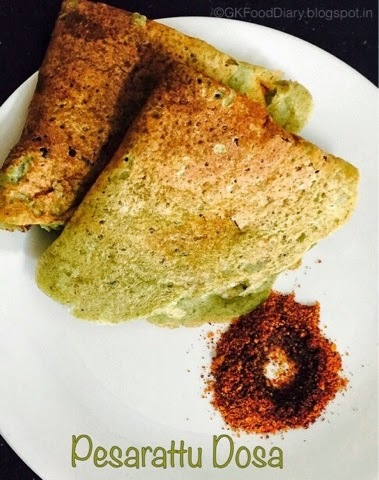 Famous Andhra Special recipe Pesarattu dosa. Easy and healthy breakfast. Soak green moong dal and raw rice for 8 hours or overnight. The water fully absorbed by the green moong in the morning and it will be double in volume. In a blender, take soaked green moong dal with rice,ginger, green chillies, garlic cloves and cumin seeds. Add little water and grind it to a coarse paste. Chop the onions finey and keep aside.Transfer the ground batter to the vessel and add onions,Corainder leaves along with salt. Mix well and set aside. Heat a dosa tawa, add a laddle of batter to it and spread thin or thick as per your preference. Cook until brown for three minutes and flip the dosa. Cook for another two mintutes and remove from tawa. Repeat the same process for the remaining batter.